The amount of the fee can be paid to the c/c postale n. 33087008 or wired to Banca Prossima account IBAN IT 45 N 03359 01600 100000007179, assigned to Società Geografica Italiana (Villa Celimontana) Via della Navicella, 12 – 00184 Roma). 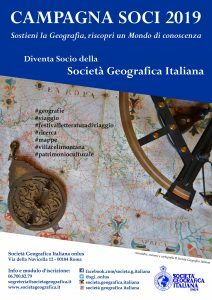 Receive free issues Bollettino della Società Geografica (relative-of-a-member members not included). Discounts on purchase of publications. Request on-demand geographic information and news from the Society. Reimbursement of expenses may be required for this service. Access to the Library, the Cartographic Archive and all Archives of the Society. Participate to the Society’s activities and events. Request on-demand geographic services from the Society, upon reimbursement of expenses and additional costs if needed. As per art. 6 of the Society’s regulation, members who are willing to terminate their membership must notify the Society in writing no later than November 1st every year. If this condition is not fulfilled, membership will be considered as renewed for another year.